It is day three of our freezer fill up. I’m not sure about the rest of you but I really enjoy my sweets. And no dinner is complete without a desert right? Today’s freezer apple pie recipe is from my wonderful friend Super Sarah. This lady has three beautiful children, another on the way and she still manages a farm with her husband and an amazing garden. Thank you Super Sarah for this simple recipe! Alright, let’s get started on these pies! 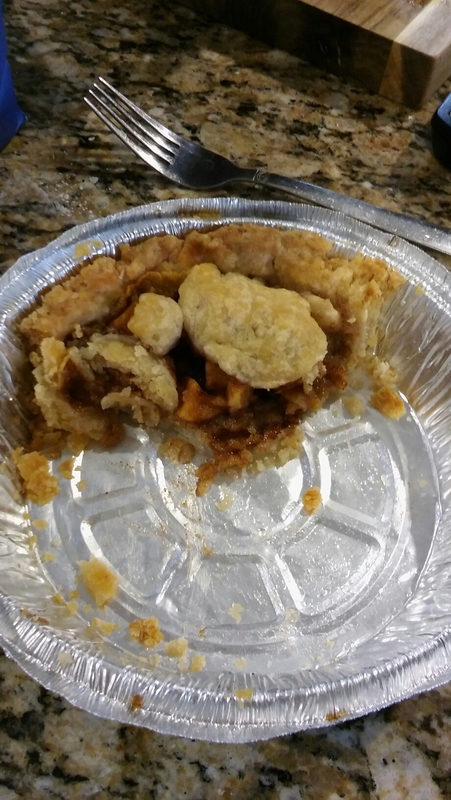 Note: the crust recipe makes enough for at least two full sized pies top and bottom. This is not a single pie recipe. 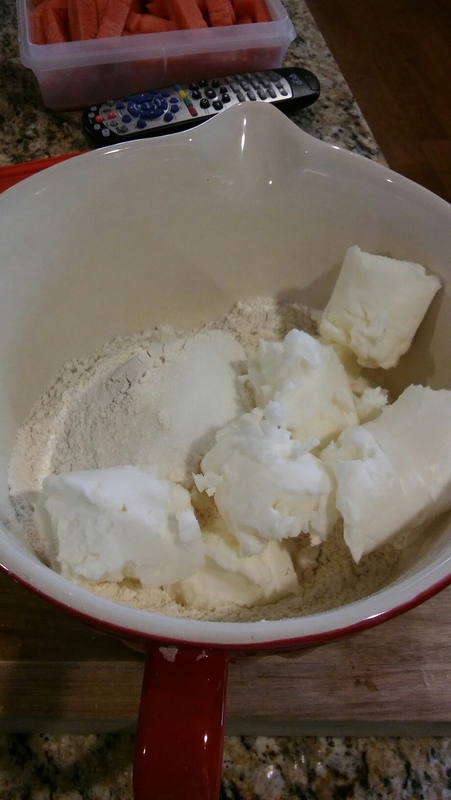 First start your crust by mixing the flour, sugar, and salt in a large bowl. 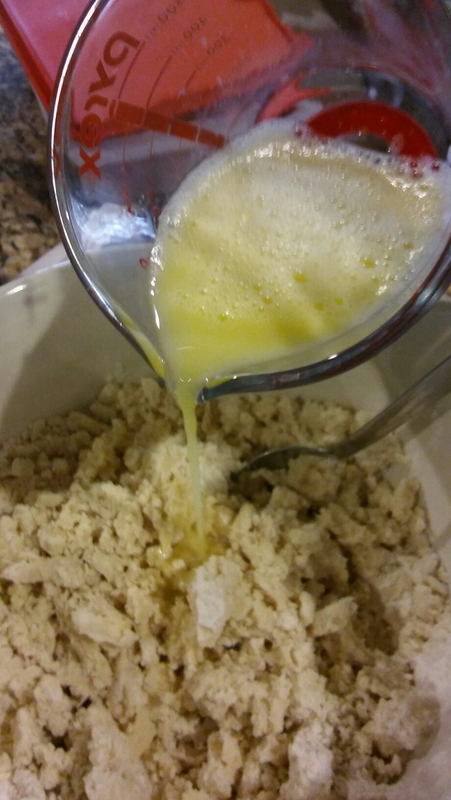 Add the Crisco and use a pastry cutter in incorporate it until it is nice and crumbly. In another bowl mix your water, egg and vinegar. Whisk them together well and add to the dry ingredients. Mix until well incorporated. Seperate into 4 and place in plastic wrap in your refrigerator. While that sits chilling, mix the sugars, and cinnamon in a bowl (I’m relbelious and used the same bowl). 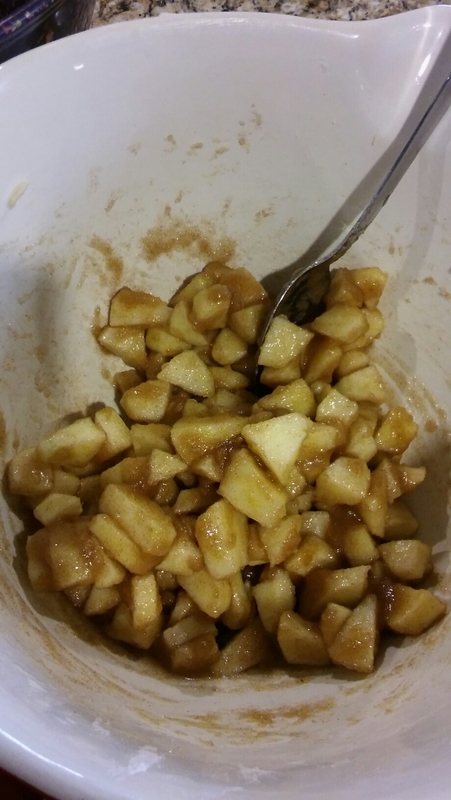 Start peeling and chunking your apples and add them to the cinnamon/sugar mixture. Mix as you go to avoid browning. 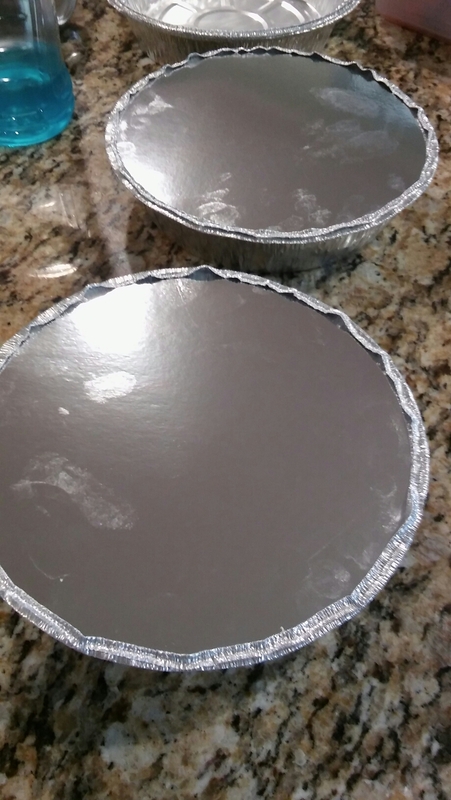 Once you feel you have enough to fill your pie shell, take your pastry out of the fridge and put it in your pans. This is very forgiving pastry so I just pat it in since my roller and I have different ideas from time to time. Optional at this point, is adding a handful of cornflakes to the bottom of your pan at this time. It helps to absorb some if the moisture and you cannot tell they are in there even. 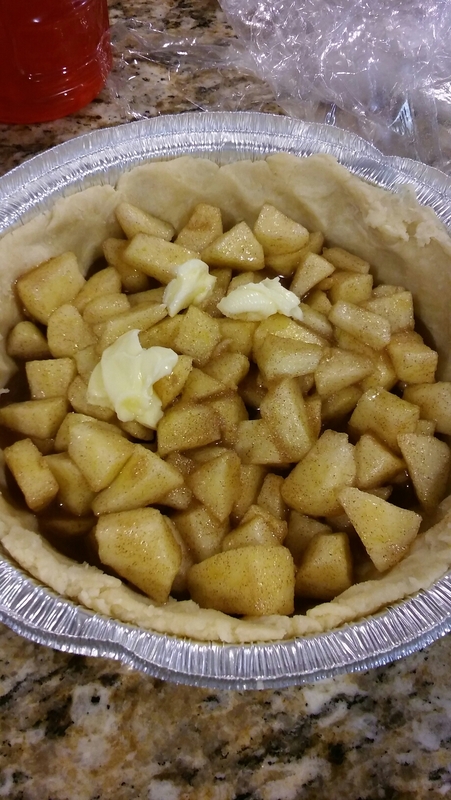 Fill the pie shells with your apple mixture. Normally you would have these heaping full, but my pans have lids that I want to use so I had to tame it down a bit. Feel free to fill as much as you wish. Another optional thing I do is to add just a tad of butter on top of the apples. This is not necessary but who doesn’t like butter. 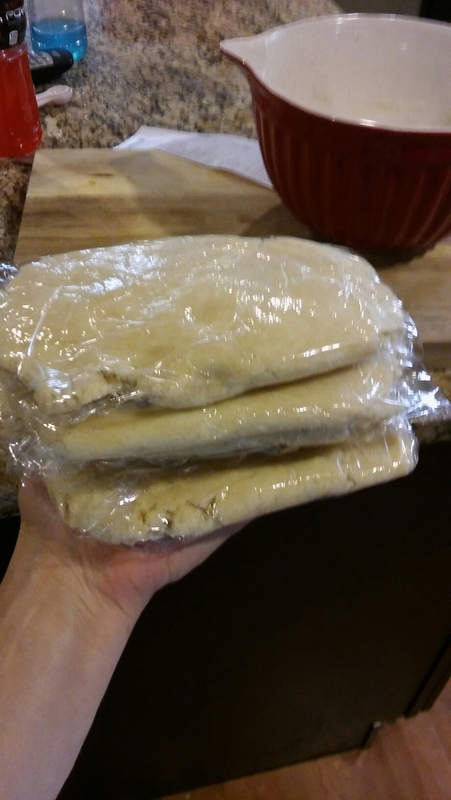 Use remaining pastry to cover your pies. Label them and freeze. To bake simple put in the oven at 350 degrees for an hour to an hour and a half. Talk about a treat to have in your freezer. This recipe is so simple you cannot help but double it. In just a few hours my sisters in law and I made eleven pies. Go use those beautiful apples and fill up your freezer. Hello! I have been making pies like crazy too! I have a very similar recipe, but we don’t use any vinegar. Is there a reason why you add it to your crust? The vinegar helps to increase the acid content. This helps to keep the gluten strands from getting to long. The result is a flaky crust. I have done plenty without it and they turn out great too but I have noticed a lighter texture to these crusts. Not as dense.